The Value Click Pen from AnyPromo is a budget-friendly promotional pen with a plunger-action click mechanism. If you're looking for a simple, budget-friendly pen, the Value Click Pen is for you. Available in a selection of 8 different colors with Screen Printing on the barrel (2 1/8" x 3/4" imprint) or clip (1 1/8" x 5/32" imprint). The Value Click Pen is a customer-voted "Top 100" item because it is practical and affordable. These custom pens are a great entry-level promotional product for small businesses on a budget or establishments that have customers who tend to take writing utensils home with them. Turn petty theft into brand exposure by putting branded pens in customer-facing areas! The Value Click Pen is an instant favorite at a price everyone can afford! Available in 8 corporate colors, sure to fit with any theme. Ink Color/Point Style: Black or blue ink with medium point. Black ink will be provided unless otherwise specified. 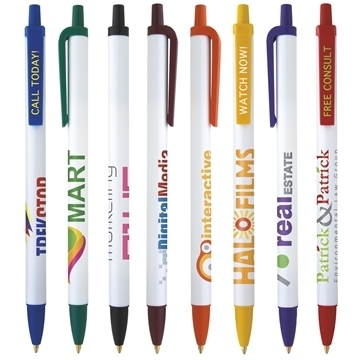 If you're looking for an inexpensive promotional pen, the Value Click Pen is a customer favorite. This classic click pen can be screen printed on both the barrel and the clip. 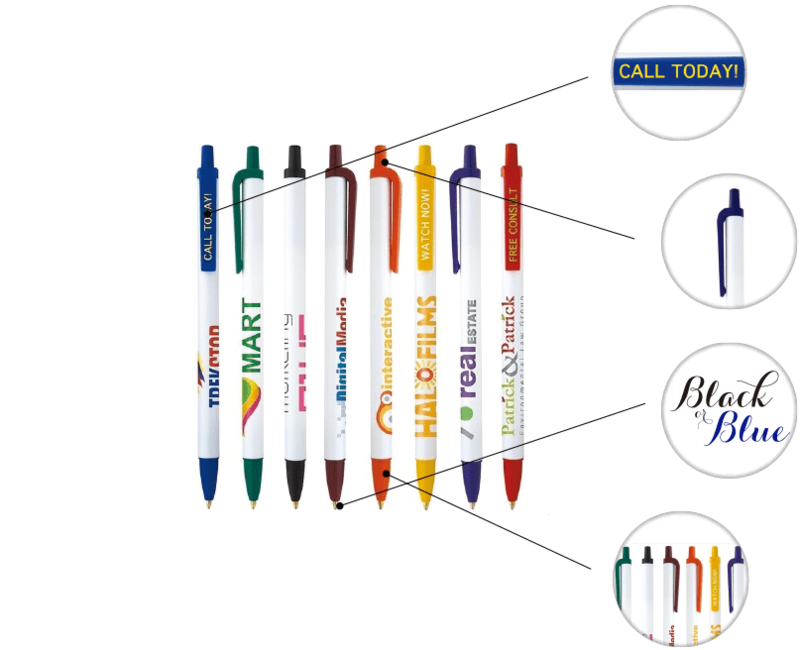 The Value Click Pen not only comes in 8 different colors, but has 29 available imprint colors and an option between black and blue ink. Branding doesn't have to be expensive. The Value Click Pen is cheap enough to economically replace all of the non-branded pens in your office. Do you need custom branded pens in a hurry? AnyPromo has got you covered with free 1-day rush production on the Value Click Pen. Great value and excellent work. great value. exceptional customer service from designing to delivery . fast , professional and great product for the money.